Malin’s new QDX Release Clip is absolutely perfect for trolling live or dead bait. This release clip features Remote Manual Release technology, (RMR). RMR allows the angler to manually release the fishing line from the clip. 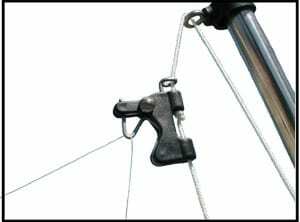 Simply pull the outrigger halyard until the QDX hits the top outrigger eye. This causes the QDX to open, and releases the fishing line. RMR is ideal for slow trolling live bait. Since you can release the fishing line prior to hook set, you won’t have any slack line to contend with. The RMR feature also works great when you want to drop a bait back to a fish, or if you want to clear your outrigger lines when there is a fish on. The QDX release clip has fully adjustable release tension and will open on its own when a fish strikes. 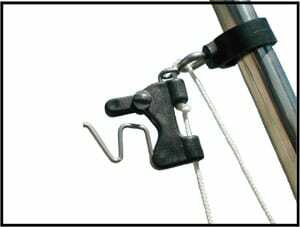 Malin also offers a complete outrigger rigging kit which include a pair of QDX release clips. The suggested retail price for the QDX clip is $14.95, the rigging kit retails for $75.95.